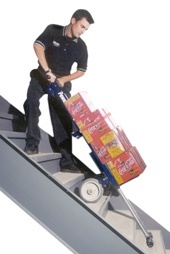 The POGO P-2 is our lightest stair climber and is ideal for lifting jobs up to 220 lbs. 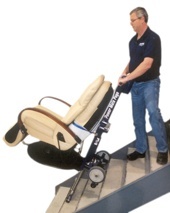 Used extensively in the home medical equipment (HME) market, the POGO helps prevent injuries due to lifting strain. 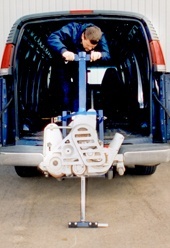 The POGO is easy to use and has a 32" lifting height and can load itself - and your load - into vehicles. The POGO P-2 comes with wheel brakes, sealed gel rechargeable battery and charger. 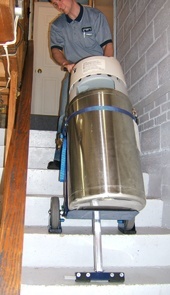 The POGO P-2 is the ideal moving solution for moving home oxygen vessels. Size: The P-2 is relatively light and has a small foot print - ideal for home delivery. 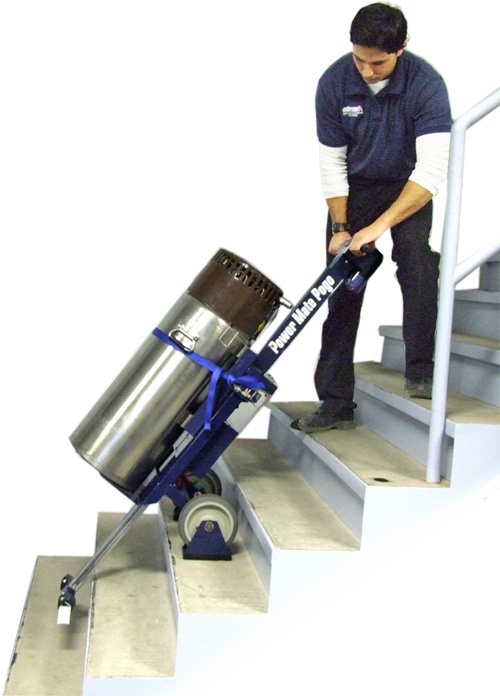 Lifting capacity is 'right sized' for your applications at 220 lbs. The POGO P-2 comes standard with wheel brakes. Backed by the manufacturer! 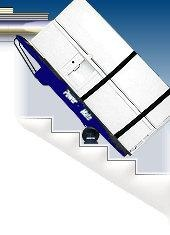 We not only provide stair climbers and LiftGates but also complete moving solutions including superior customer service and training. Our 1-800 number is prominently displayed on your PowerMate. Our customer service personnel are always happy to help with on-site support. Lifting Capacity - 220 lbs. The PowerMate POGO P-2 comes equipped with Battery Pack, Battery Charger and Wheel Brakes. In-vehicle Battery Charger, Cradle attachment for cylinders or vessels. 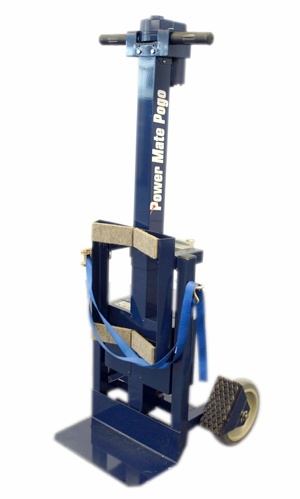 22 " x 19" x 48"
The PowerMate POGO P-1 and P-2 are our smallest profile stair climbers - ideal for the HME market. PowerMate POGO P-2 motorized stair climber comes standard with wheel brakes! Why should you buy a POGO? 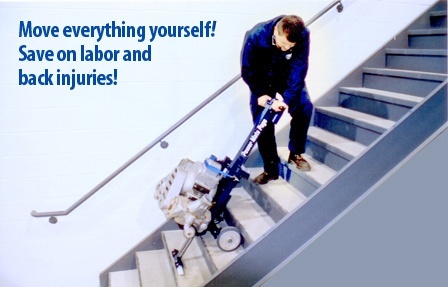 For the same reasons you would buy any PowerMate stair climber; to save money on labor costs and cut down on job site injuries. The POGO P-2 is ideal for the HME market due to its small profile and light weight. The machine is 'right sized' for home oxygen vessels, is easy to use and battery able to keep up with a demanding delivery schedule. The POGO has a narrow footprint and is only 22" wide - Ideal for those tight landings and stair wells in residential homes! The POGO's also have a full length bottom rubber guard to protect clients' property - just like the big machines! 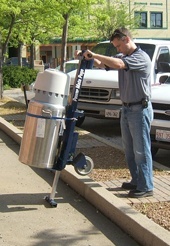 Use your POGO to move floor sanders, concrete grinders and polishers. 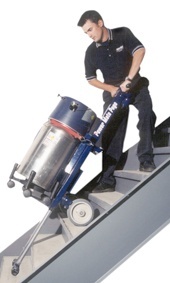 For larger loads consider the PowerMate L-1 or PowerMate LE-1 powered stair climber.